Rating submitted proofs has never been this easy in Microworkers. 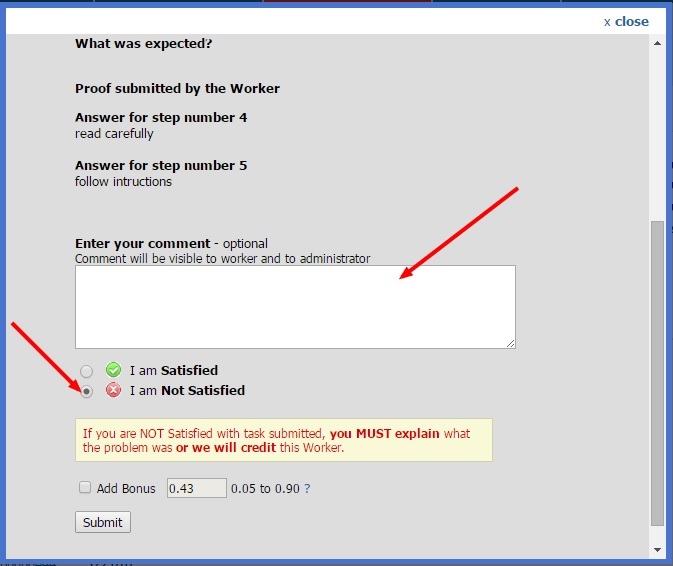 For new Employers, this tutorial will show you how you can rate Workers. Read on. 1. Go to “My Campaigns” page and select from Basic or Hire Group campaign. Choose the campaign you want to review. Click on the “Submitted tasks” link that you will see under the campaign title. 2. Now you will see a list of all submitted proofs in a single page. The first column shows the Task IDs of the Workers whereas the second column shows their User IDs. The submitted proofs are shown in the third column. To view all submitted proofs in one screen, click on the “Expand” link. 3. All submitted proofs are being verified by the admin personnel before it goes through the Campaign page. When you see a broken line in a circular form, this indicates that the proof is still under verification but will be available shortly. 4. If you find the proof to be correct, just tick the box on the left side and click the “Satisfied” link at the bottom of the page. 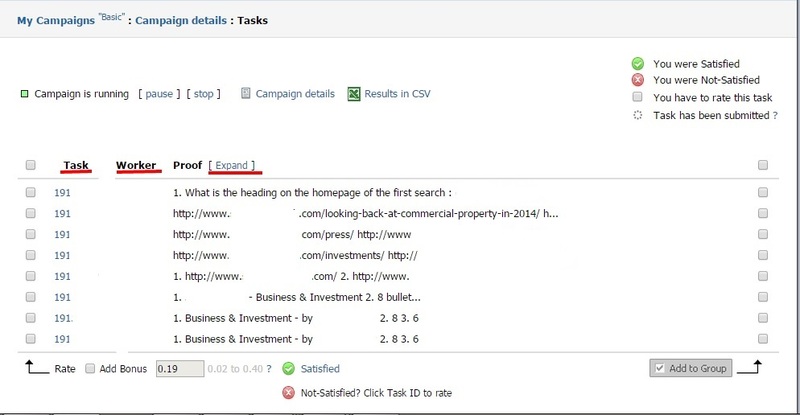 If all proofs are correct, tick the box found at the top, beside “Task” so all proofs will be marked as Satisfied. 5. You may add a bonus to each Worker should you desire. Tick the box for “Add Bonus” as well as the box for the certain Worker you wish to reward a bonus then enter the amount and click Satisfied. Please ensure the tickbox for bonus remains uncheck when you are rating Workers. By default, it is set as unchecked. Should this option be chosen, mass bonus will be awarded to all Workers who participated in your campaign. So if there are only few Workers you wish to give bonuses, manually check each box. 6. Now should you find the submitted proof unacceptable, click on the Task ID and a box will open. Enter your reason for declining it, tick the button for “I am Not Satisfied” then click Submit. Alternatively, you may enter an instruction on the same box on how a Worker can correct his/her task. This is discussed in the other article regarding How to Reverse Rating. If you want a copy of all the results, you can download them in CSV format by utilizing the “Results in CSV” link under the title. Should you encounter any problems in rating, please contact our Support, we would be very happy to help. It is really help full to rate any job.